As expert torsion spring manufacturers, we know this type of spring is ideal where there is a requirement for angular movement with the legs of the spring attached to other components. When those components rotate around the centre of the spring, the spring tries to push them back to their original position. 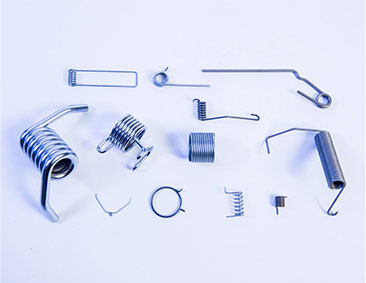 Torsion springs are used for hinges, counterbalances and lever return applications. Double Torsion Springs are two single torsion springs connected together. They usually consist of one right hand coiled and one left hand coiled bodies both working in parallel with each other, doubling the effective torque available from a single torsion spring of the same size. Designs can be diverse, with centre sections and legs manufactured to any shape with the coiled bodies pitched open or closed. Double torsion springs usually work over a shaft running through the coiled bodies with either the connecting centre section or legs securely fixed. As with single torsion springs, double torsion springs should not be designed for use by winding backwards. We have continued to invest in modern CNC coiling equipment and in the training of our staff to enable the production of complex torsion spring designs and leg shapes by CNC or traditional methods. We use the latest spring design programmes to assist in solving particular torsion spring design issues and can produce a range of samples for design verification and testing. It’s helpful to know where a spring is designed to fit and what the sizes of the hole and shaft are. Please also let us know of any other important dimensions.